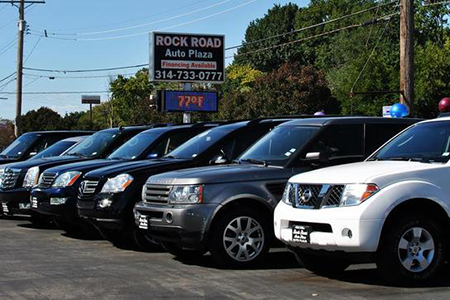 Rock Road Auto Plaza in St. Louis Can Find Your Used Car For Sale Today! Are you searching for the right used automobile, but you are not exactly sure how to get your hands on one? Then now is the point to turn the discussion in the direction of Rock Road Auto Plaza's extraordinary pre-owned automobile locator service. The most exciting element of taking advantage of the leading pre-owned automobile locator program in St. Louis? By filing an inquiry into this service, you will not only get the automobile you need, but you also get to skip out on the problems that come with with dealing with other, less professional, used vehicle sellers in the St. Louis community. Considering how important this endeavor is to making sure that your everyday drive is always a cinch, why should you ever be happy with anything that is beneath the marketplace-defining commitment to first rate assistance and service for used vehicle customers found at Rock Road Auto Plaza? If you are prepared to learn even more about how our used vehicle locator program actually works, feel free to spend a few moments with the group of automotive experts here at Rock Road Auto Plaza as we break down all of the things. After doing this, we have no doubts that you will be the holder of all of the insight you must possess to make an informed decision regarding your pre-owned prospects. The best way to get this dialogue off to a fast-paced beginning is by delivering a little insight into how we find the best used automobile for you and your loved ones. Before everything else, Rock Road Auto Plaza needs a couple of pieces of information from you. Thankfully, our uncomplicated and user-friendly form available to you on this page is ready to channel this data right to our used car specialists. As soon as this insight is in our possession, we will get started on the process of working through our dealer network resources to bring to you the precise pre-owned car that strikes your interest. From this standing, why would you ever unnecessarily waste your time sifting around in the newspaper or sorting through deceptive pop-ups and other aggressive ads on third-party pre-owned automobile websites again? Going a little bit further, the group of experts found here at Rock Road Auto Plaza will do what is required and beyond for our fellow community members here in St. Louis in every way possible. To help you get off on the right foot, you can always count on our pre-owned car locator tool being offered at no cost to you. Even though other dealerships might intend to charge you an excessive price as part of helping you get a hold of the ideal pre-owned vehicle, we feel that delivering you the support you need to have on this front is vital to a truly winning dealer environment. Do a Little Bit of Research Beforehand – Even though spur of the moment shopping is definitely a fun aspect of the search for your next used automobile, do what you can to not be drawn in by merely the first reaction you have to an automobile that arouses your interest. Doing some searching into the the vehicle's durability, interior creature comforts, and other aspects that can augment your everyday drive will give you the knowledge necessary to figure out if this automobile is truly able to meet your demands. Sit down and Have a Talk with Family and Friends – Leaning on the guidance of others absolutely goes far when purchasing a used car. By reaching out to honest close friends and family members, you reach an entirely different point of view on your pre-owned vehicle search – and perhaps come across a viewpoint or way of reasoning that modifies how you accomplish this undertaking. Be as Comprehensive as Possible – As you wrap up the following used car locator application, try to be as expressive as possible. The more details you hand over to us, the more likely it is that our team will come across the perfect used automobile for you in an expedient fashion. Feel Free to Contact Rock Road Auto Plaza's Crew of Pre-Owned Authorities – If anything shifts during this process, do not be scared to tell us! We are always here to support you, so feel free to stay in touch and keep us up to date if you want to rework the search for your next used car, truck, or SUV. With these suggestions leading the way, we have no doubts that the used car that fits into your everyday routine (be it a Certified Pre-Owned or a vehicle from an alternative automaker) will be parked in your driveway in the blink of an eye. What Is the Next Step in the Hunt for the Perfect Used Car? Now that we have caught you up to speed, there is probably only one inquiry left to cover: "How do I get started with discovering the right pre-owned car for me?" Thankfully, getting the ball moving on this undertaking is as effortless as filling out a fast form or picking up your phone and engaging in a quick phone call to Rock Road Auto Plaza. The only thing you need to do is simply complete the application we have offered up here when you are not busy (do not forget to be as comprehensive as you can!) and we will handle the rest. If you want to sit down for a more in-depth dialogue, go ahead and and connect with us at 314-733-0777 or drop by whenever you have a free moment and are near us; no scheduled appointment is required because Rock Road Auto Plaza's front doors are always opened to our good friends in St. Louis!